Cantilevered staircase with 88mm Sydney Blue Gum tread sleeves. 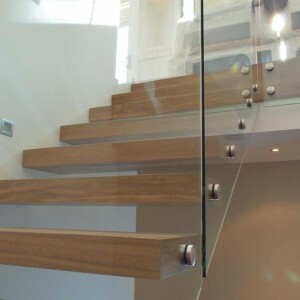 Balustrade consists of 12mm glass balustrade with 50mm patch fittings, offset 50mm round handrail. Tread sleeves and landing finished in Bona Traffic Anti-slip. Less than 3mm movement when weight was applied to the outer edge of treads. 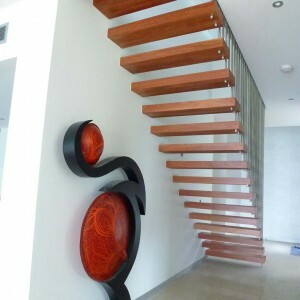 Cantilevered staircase with 88mm Sydney Blue Gum tread sleeves. Balustrade consists of 19mm diameter stainless satin tubes to first floor.